This week, following some interesting gains in the open-tamil project, and updates to urbantamil.com I am writing about some interesting word-frequency analysis of the Tamil vocabulary. Using the historgram technique, binning up the Tamil letters by word-length, from the UrbanTamil.com corpus of 63222 words, we see a chart like the one below. 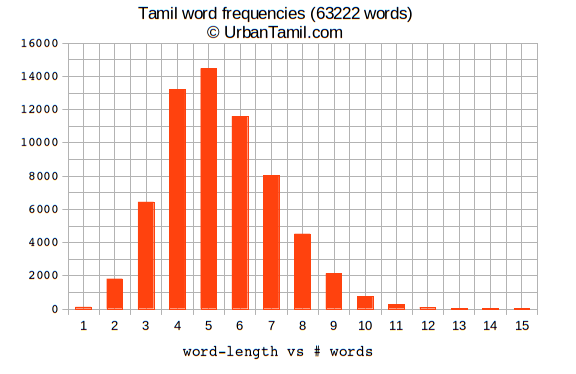 Tamil word frequencies by word-length, from the UrbanTamil.com corpus of 63222 words. This is a power-law distribution but not the same as Zipf’s law distribution, which we could analyze in a future post. Thanks for reading. Have a good week ahead. Hello traveler and Tamil language aficionado. Today I’m researching about Tamil lexicography, and I’m sharing the results of my searches through this blog post. It is more on the research side, than demo’s or expository blogs of the post. Senthil Nathan of Arithi.com has blogged about using UTF-8 in Tamil text processing. Something we like at the open-tamil project. Check our Python codes if you have not already. In this article he posits the longest Tamil word has to be the proper-noun, “திருவாலவாயுடையார்திருவிலையாடற்புராணம்“. Any comments on that? I think if we looked at verbs of adjectives we may reach the proper answer. Lets try and answer this question with the open-tamil tools (assuming you have installed it!) and type the code at the Python shell. 3. Now we realize this is only 20 letters long. Comparatively the English word ‘pneumonoultramicro silico coniosis‘, a disorder where the lungs are affected by silicion particulate matter, measures to be upto a whooping, 45 letters long! In English language ‘AVOCADO’ comes after the word ‘APPLE’ in the dictionary, because of the dictionary-order or lexicographic convention. It is often preplexing to me that Tamil language sorting is not well defined. Our vowels, 12 of ‘அ,ஆ,இ,ஈ, – ஒ,ஓ,ஔ,ஃ’ are well ordered. But the consonants, 18 of ‘க,ச,ட,த,ப,ற, … ஞ.ங,ண,ந,ம,ன’ are not because there is more than one ordering. What is the norm here? So in combination the 247 Tamil letters don’t have a canonical dictionary order. This lack of lexicographic ordering convention makes dictionary ordering of Tamil words difficult. Clearly we could make a choice, but what is the norm? What is your language solution? Share your comments and strategies. Turns out all this is pretty neat stuff for the Tamil text processing in open-tamil/utf-8 package! Chrome இல் இருந்து தமிழ் கற்க, உங்கள் தமிழ் சொல்லகராதி ஆராயுங்கள். தமிழ் மொழியையும் கற்க. தமிழ் வட்டார, மற்றும் பல்வேறு தமிழ் வட்டார பங்களிப்பு – அனைத்து உங்களது உலாவி ஆறுதல் இருந்து மதுரை, சென்னை, இலங்கை (இலங்கை) மற்றும் உன்னதமான மொழி. This is a open source Chrome extension.